iPad Garageband Lesson. In this songwriting project explore Apple’s Garageband App. Establish your music technology skills as you create unique compositions. iPad Garageband Music Composition Lesson. Using iPads equipped with Garageband we can explore rhythm, harmony and melody writing using some of the advanced features of this digital audio workstation. Play software drums, keyboards, guitars, and more. Develop versatility, creativity, and originality using digital instruments. Delve deep into song structure, build verses, choruses, bridges, and compose thematic mood music. This iOS Garageband lesson is a contemporary approach to music education that seamlessly integrates the iPad into your music curriculum. Music technology made easy. Listen to some work from past projects here! Music Hands deliver workshops with our 32 piece digital orchestra, in school hours or extra-curricular. All equipment and resources provided. We’re ready to tailor the project to meet your requirements. 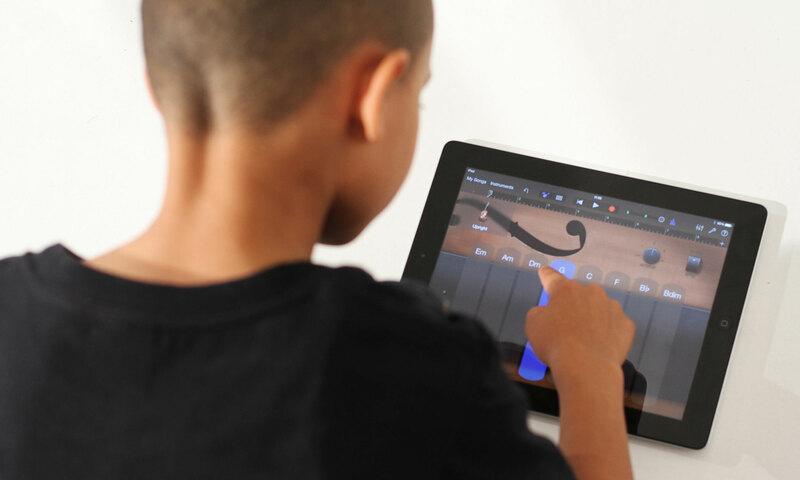 We have a range of projects on offer Browse our Workshops page to learn more about our iPad, World, and Urban Music Services.